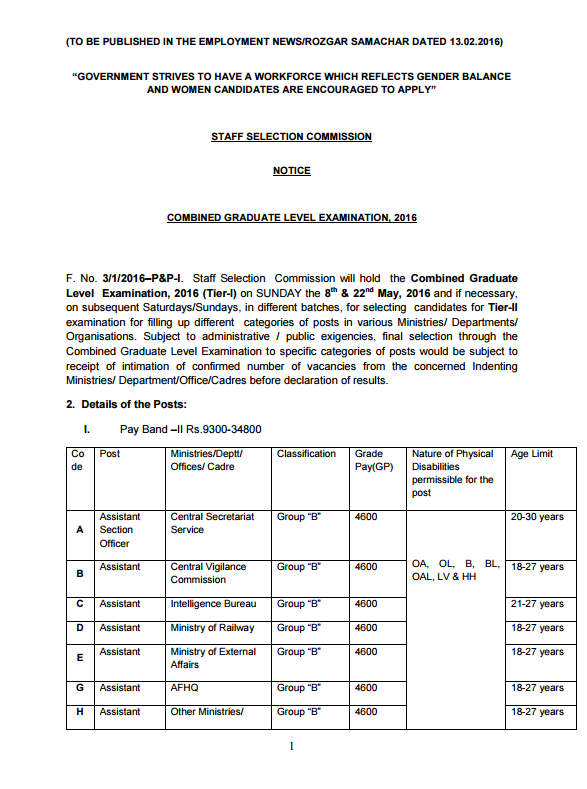 The Staff Selection Commission MPR Region has released the much awaited SSC CGL 2016-17 Official Notification. You may download it from below given links. Update** Though SSC MPR removed notification link SSC NER has uploaded SSC CGL 2016 notification pdf, now wait a couple of days for SSC official notification at www.ssc.nic.in. Anyways all the notifications are same you may download a copy from here. Last date of Online Application : 10.03.2016 (5:00PM) for Part –I Registration and up to 14.03.2016 (5:00 PM) for Part - II Registration. Probable dates for CGL Tier -2 Exam are 13.08.2016 (Saturday) & 14.08.2016 (Sunday). No Direct Recruitment of STA, Sr. Auditor or Sr. Accountant for SSC CGL 2016. Vacancies will be intimated in due course. Age limit will be reckoned as on 1st August, 2016. Scheme of Examination is same as in previous years. With Tier 1, Tier 2 and Tier 3 (CPT/DEST/Document Verification). The Commission reserves the right to make changes in the scheme of examination such as conduct of Tier-I and Tier-II examination in computer based mode, treating Tier-I examination as only qualifying etc. Paper IV General Studies (Finance and Economics)in Tier 2 may be introduced for AAO Post. OMR Answer Sheet to be filled with Black Ball Pen only. Candidates may submit on line applications at website http://ssconline2.gov.in and http://sscregistration.nic.in. Sharing is Caring, Please share this post to your friends.